Plano, TX, December 05, 2018 --(PR.com)-- Azpen Innovation, an award winning developer of wireless charging products for Qi enabled devices, will launch an innovative Qi Wireless Charging Sound Hub with the Google Assistant at CES 2019. 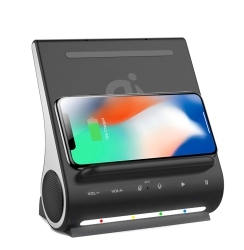 The DockAll Assist model G600 is an all-in-one docking station with Qi Wireless Charging and Google Assistant built-in to charge and control devices at the same time. The DockAll Assist has been upgraded with fast wirelessly charging for smartphones or cases enabled with Qi wireless technology, three vertical 10 watt wireless charging coils and two full-size USB charging ports on the back to allow three devices to charge simultaneously. It features dual-channel NFC 5-Watt Bluetooth 4.2 speakers, a built-in microphone, and a MicroSD card slot which supports cards up to 64GB. Manage your audio, volume, and tracks directly from your device or from the DockAll’s front control panel. The dock itself charges horizontal or vertical devices up to 8 inches and positions at a comfortable upright 60-degree viewing angle. The DockAll Assist will be on display at CES 2019, January 8-11 at the Las Vegas Convention Center, South Hall 4, upper level, #36170. For more information or to arrange an interview, contact Mike Glasscock at mglasscock@azpenpc.com. A subsidiary of Mingtel Corporation, based in the rapidly growing Dallas suburb of Plano, Texas, with offices throughout the USA, Azpen is an award winning global supplier of consumer electronics, tablet PC’s, charging devices, Google Assistant integrated smart home products, and wireless accessories to the retail, wholesale, e-commerce, and B2B channels. Since 2008, the Azpen Innovation team is committed to developing creative, forward thinking products with cutting-edge technology, designs, and features focused on filling a need with cost saving solutions. "Innovative, Intelligent and Affordable."